I used Red Heart Boutique Unforgettable. It is a 4 medium in weight and called Echo and I used a size 6mm or J afghan hook. Also a size 5mm/H crochet hook for the border. Now you take them off the hook by Going through 1 loop and then going through 2 loops at a time till they are all off your hook. 3. You always skip the first bar, and go in between the next stitch, pull up a loop and keep it on your stitch, keep putting on a new stitch. 8. (I say row 19 on video) We decrease here again. 1. Using a size 5mm or H crochet hook, Right side facing you, sc 88 stitches along the border of the hat, ss into 1st stitch and chain 1, then do a sc in each of the following 87 stitches = 88 stitches. Joining the other side, slip stitch into the chain you made. 4. Ch3, skip the next sc, 1sc in the next stitch, skip the next 2sc and do 9sc in the ch7 space, skip the next 2sc and do* 1sc in the next one, 1dc in the next, 1sc in the next, skip the next 2 stitches, 9sc in the ch 7 space, skip the next 2* repeat the instructions between the stars to the end finishing by skipping the last 2 and ss into the top of the beg ch3. Sew your hat together and you are done. This is a really cute poncho which is made out of squares and is pretty easy to assemble. I hope you have fun making it! You can crochet it together as you go or you can sew it together. Remember that the numbers here correspond to the numbers on the video! This is the schematic to the poncho. Where the dotted lines are, that is where it will be folded over. The numbers I will be numbering down below (1-7) and explaining are the ones circled on this schematic. One Square measures about 6.5 inches. Dc 2 tog = yo, hook into specified st, pull up a loop, yo and draw hook through 2 loops (2 loops left), yo, hook into specified st, pull up a loop, yo and draw hook through 2 loops and then through all the rest. I used I Love this Yarn, super soft. Neon colors, yellow and pink. It is acrylic and a 4 medium. I used a size 5.00mm/H crochet hook. You will need about 3-4 skeins of the pink and about 3 of the yellow. Join a strip of 10 motifs together first and then you will join the others. 4. Ch5, 1dc, ch1, 1dc, ch1, 1dc, all in the 1st space, *1dc, ch1, 1dc, ch1, 1dc, ch1, 1dc In the next ch sp (skip over the 3dc)* rep to end, ss into 3rd ch. Cut off yarn. Ch2, 2dc tog in the next 2 spaces (the middle space and the 1st space of the 4dc), ch3, sc into next space, ch3, *3dc tog into next sp, ch3, sc in next sp, ch3* rep to the end and ss into the top of the 3dc tog. You will join a strip of 10 together first and then join the other strip of 10 onto that strip and another set of 10 onto that strip so that you have 3 strips of 10 joined together. 9. I am showing you how to join the very first square to another one. Start anywhere on the edge of poncho only on the outside not by the neckline. 14. Neck Edge Border. Make sure your poncho is the way I am wearing it on the introduction with one square at the bottom and it forms a triangle. That is the way the neck border is being done. 15. First row ch3, 1 dc in each space on the squares. 2nd row, 1 dc in each space. Place a piece of yarn by the V on either side so you know where to decrease. 16. On rows 3, 4 and 5 you (changing color on the 4th row) decrease. 22. Ch3, skip 1 stitch, sc into the next stitch, ch3 and then go backwards and do a sc into the stitch that you had missed. *ch 3, skip 1 stitch, 1sc into the next stitch, ch3, 1sc into the missed stitch (backwards)* rep to end. 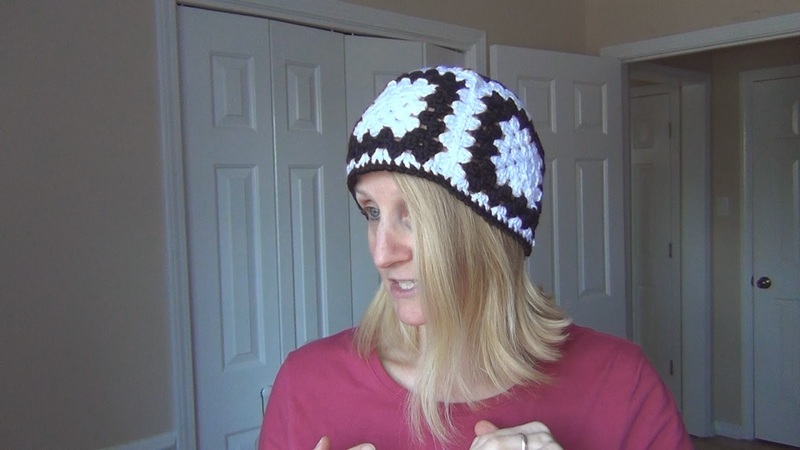 This is a lesson on making a granny square hat using 5 squares and sewing them together. We are making 5 granny squares with 6 rounds each measuring about 5.5 inches.